The KM 75/40 W Bp (Wet Battery) is perfect for high performance indoor and outdoor sweeping with its user friendly, easy maintenance design. With a battery run time of approx. 2.5 hours, 40 litre waste container, bulk waste flap (for large items) and manual filter cleaning whilst in use the KM 75/40 W Bp can sweep for long periods without stopping. 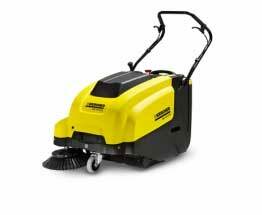 The machine is ideal for cleaning various floor types including asphalt, pavements, concrete and hard floors offering an area coverage of up to 3375m� per hour. Also available is an optional carpet cleaning kit.